San Francisco was dark and cloudy on the day we decided to hike, though, thankfully, it did get warm and sunny a bit later. 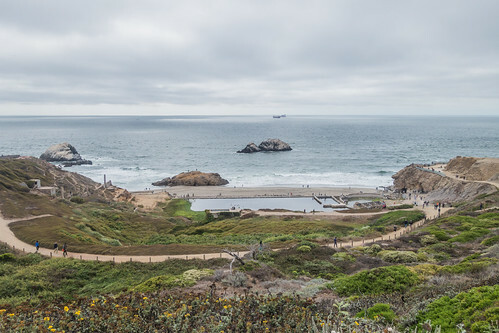 The stunning views of Sutro Baths welcomed us at the starting point. It was tempting to go down and walk around the site but we decided to stick to the planned route. Sutro Baths was bookmarked for a later visit. 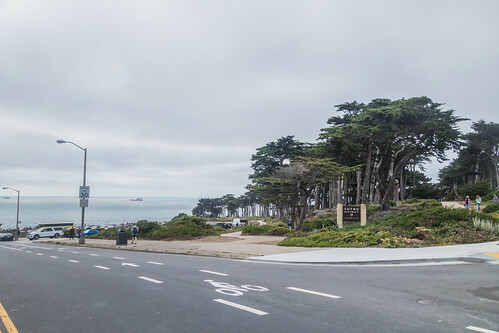 The Lands End Trailhead is near the Lands End Lookout Visitor Center. 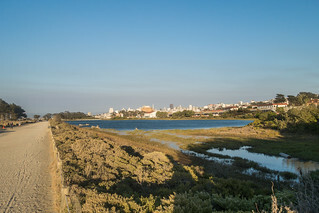 The Lands End Trail overlaps and crisscrosses the Coastal Trail, which runs all the way from Fort Funston to Fort Point. 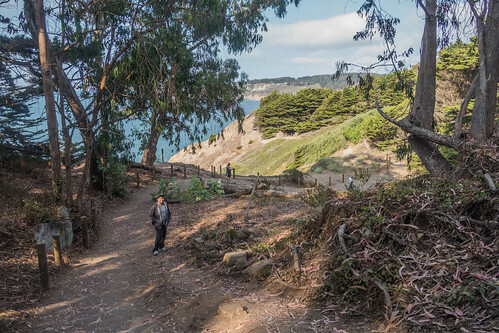 The northwestern corner of San Francisco is a green patch covered by characteristic Cypress trees and the Lands End trail is flanked by these green beauties throughout. 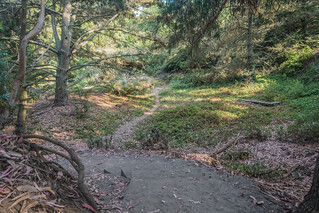 The 1.5 mile trail begins as a paved path, submerges under a thick layer of sand closer to the cliff edges, and then gradually tidies up with a layer of dirt and gravel. 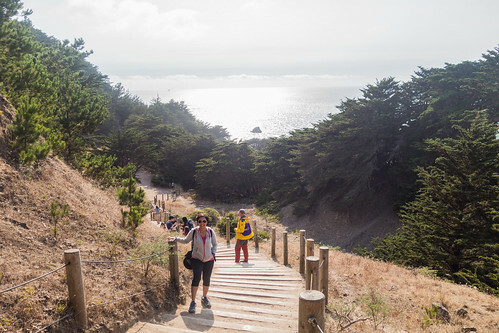 There is a steep stairway, covered with sand, going up and down on the trail route. 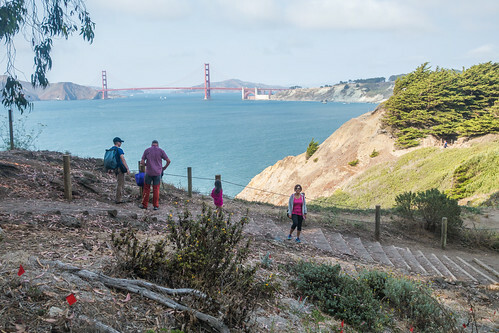 As the trail keeps winding into the woods and back to the coast, you get endless views of the Golden Gate Bridge, each breathtaking. You just cannot get enough of the stunning vistas. 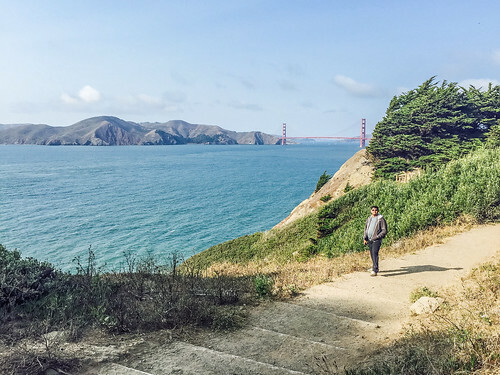 On this hike, we viewed the Golden Gate bridge for the first time from the western end; it looked ever so grand, majestically rising high above the waters. No pictures can express what you feel viewing this manmade marvel in person, even if from a distance, under the vast blue open skies, holding two giant land blocks together as well as taming the bay waters. 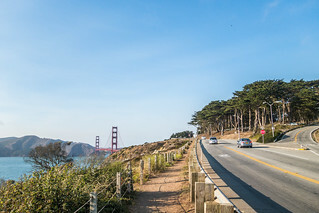 Past the Lands End Trail, we took the El Camino Del Mar and Lincoln Blvd to reach the Golden Gate Bridge Visitor Center. 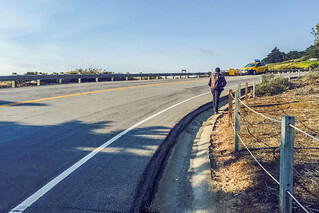 At some sections, there were no sidewalks and the shoulder was extremely thin. At the Golden Gate Bridge, it was a bit tricky to find the subway to cross the bridge. On the other side of the bridge was a completely different world; no tall trees, just vast open fields. 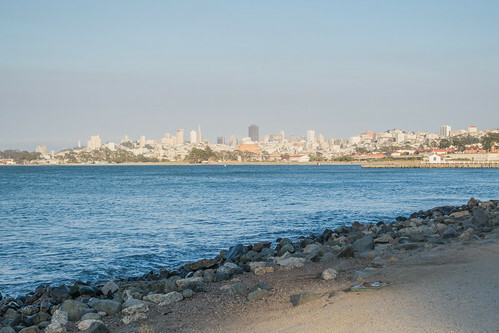 Here we walked the San Francisco Bay Trail across the Crissy Field, the Marina Blvd, and the Fort Mason Center. By this point (5 miles / 8 km), we were beat. Our feet and legs were sore and our destination was another 3 miles away. There was not much elevation gain during the entire hike, but I guess the constant and innumerable photo stops and a large portion of hard walking surface wore us out. It was killing to walk this stretch, but we somehow managed to make it to the Ghirardelli Square. We approached the Ghirardelli Square for the first time from the west. The sunset provided a lovely backdrop and an apt setting for completing our 3.5 hrs hike. Once at the square, we took a very deep breath, stretched our limbs, and fed our grumbling tummies. As we were leaving the restaurant, we realized we could not take one more step! Had to call an Uber to get dropped back to Daly City where our car was parked – a comical and memorable ending to the “hike”!! 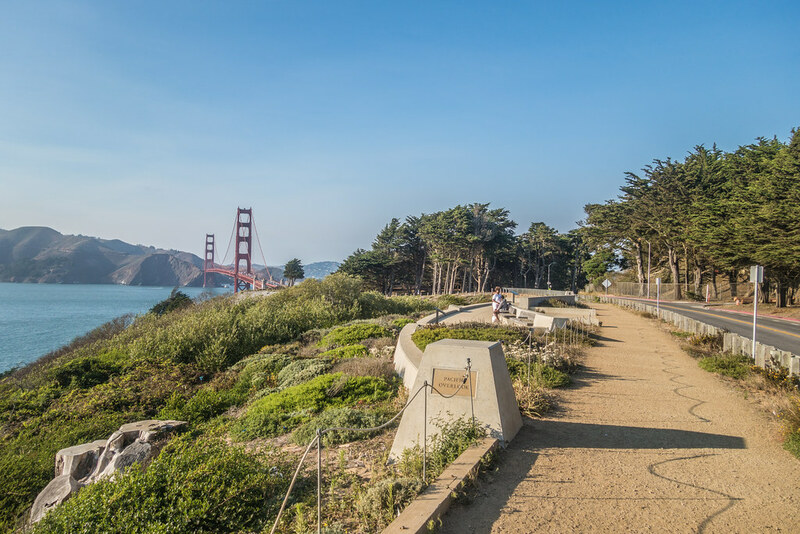 Crissy Field was an amazing find for a picnic spot and summer grilling. 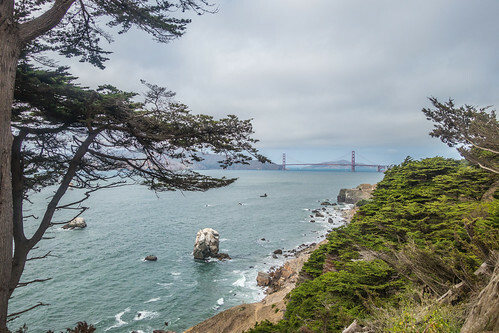 The Fog City Travel Guide provides an interesting historical account of Lands End and Sutro Bath ruins. Parking Lot: We always take a BART to San Francisco from Milbrae or Daly City. For this trip, we drove to Daly City. The BART parking lot at DALY City is small with limited space. You could, however, drive to San Francisco and park at Lands End Main Parking Lot, Merrie Way, San Francisco, CA 94121 or at the USS San Francisco Memorial parking lot. There seem to be couple of parking spots at Fort Miley as well. 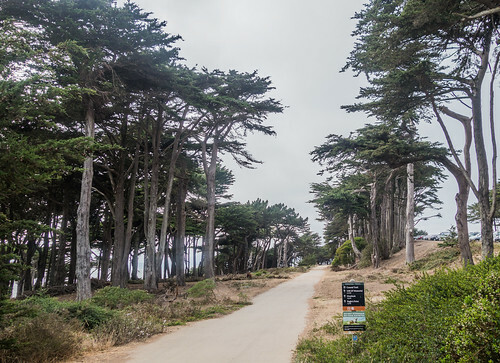 Or if you are lucky to find a spot, you can park anywhere along Point Lobos Ave near the Cliff House. Parking Fee: Parking at BART stations is free on weekends. 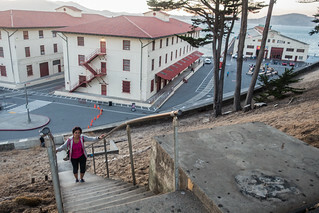 Cost of rides on buses 28 and 38 from Daly City to Point Lobos Ave: $2.25. If you plan to drive to San Francisco and park in the vicinity of Lands End, the parking lots here are free. Restrooms: There is one public restroom next to the Lookout Cafe at Point Lobos Ave.
Map: You can buy the required set from Lands End Lookout Visitor Center. 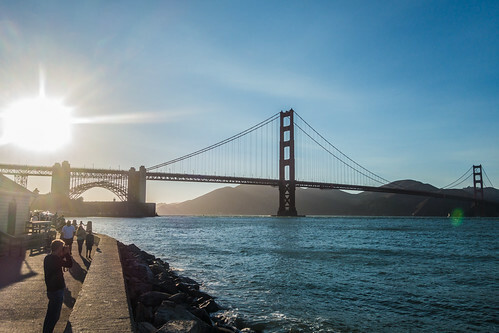 Exposure to sun: San Francisco is usually cloudy and windy but it is not surprising to get caught in bright sunlight. Layering is the best option to be prepared for all types of micro climates. Crowd: Weekends are pretty crowded, both with hikers/bikers/joggers and tourists.